Shelter in Place is a protective instruction that officials may issue when an area is threatened by a chemical release. This may involve an industrial or transportation accident. For southeastern Fayette County and other areas near Richmond, it also could involve an accident at Blue Grass Army Depot’s chemical weapons stockpile. Turn off all fans, heating systems, and air conditioning systems. Go to an upper-story interior room – preferably one without windows. Bring all pets with you. Also bring a battery-powered weather radio and extra batteries so you can continue to monitor emergency broadcasts. Use duct tape and plastic sheeting to seal all cracks around the doors and windows, as well as any other vents. If you don’t have these supplies, you can improvise with damp towels. 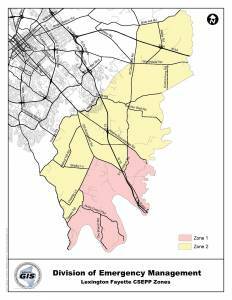 This map shows Fayette County’s CSEPP protective zones. 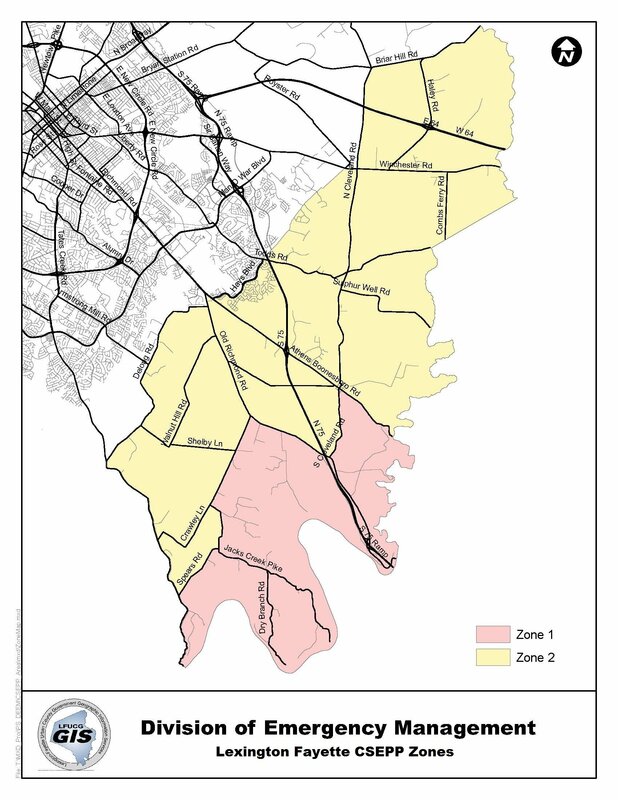 Zone 1 is in pink; Zone 2 is in yellow. Click the image for a larger version. For detailed instructions on how to shelter in place, read this PDF document and watch the videos to the right.